Nasturtium leaves and flowers add vibrant pepper flavours and colour to salads and the nasturtium seeds that form in late summer/fall are sometimes used as a local replacement for capers. Direct seed 1.25 cm (1/2 in) deep when planting the garden in May, or start early and plant out in late May. Thin to 30 cm (1 ft) between the plants as they will sprawl to fill the bed, producing a delightful array of red, yellow and orange blossoms until the first -2 C frost. If you pick leaves and flowers sparingly and leave most of the plant you can 'cut and come again'. Nasturtiums will grow in both containers and in the ground. I prefer them in the ground as they don't need to be watered as frequently. Plant them close to the house as most likely you will want to pick from them often. 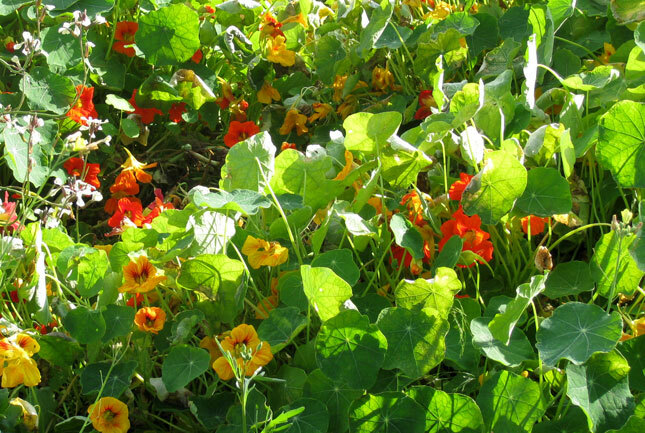 Nasturtiums are simply one of the best edible flowers we can grow.